Time for a tree-change or “See-Change?” Yes? Well, please consider the Upper Spencer Gulf city of Port Pirie…..
Modern education and sporting facilities, cheaper housing and 10 minutes to work! It’s easy to have a great lifestyle in Port Pirie with more time to fit in family, leisure, fitness, sport, culture, nature and fun experiences! Make lifelong friends and become part of a community who cares; you’ll never want to leave. The largest employment sectors are health care and social assistance, manufacturing and retail trades. Trade qualified and professional workers are in strong demand, particularly those in heavy industry, construction, health and community service fields. To see more of the great lifestyle in Port Pirie view the Port Pirie Live and Work brochure. Are you looking to replace the concrete jungle, heavy traffic, pollution and city-stress with the best that rural and coastal living has to offer? 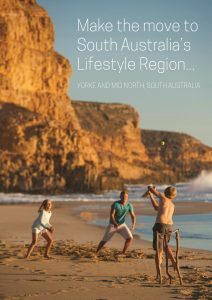 The Yorke and Mid North of SA will reward you with the perfect blend of lifestyle, opportunities and services. Click the image above to visit the lifestyle regions website!